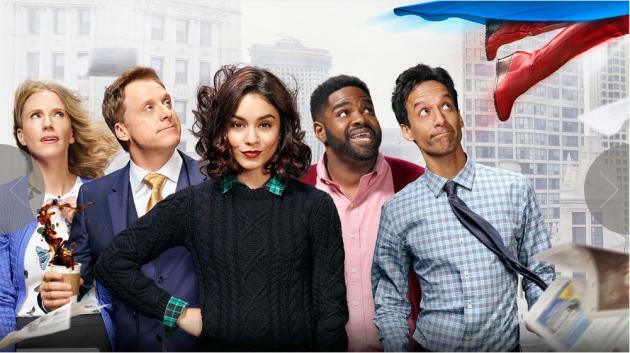 “Powerless” capitalizes on a novel idea: What is it like, in a world full of superheroes, for those civilians who don’t run around all day in a cape and tights, saving the world? The new NBC sitcom aims to find out, situated in a tiny and easily forgotten corner of the DC universe — a company owned by Bruce Wayne’s less charismatic cousin Van (Alan Tudyk), in Gotham City’s dinky neighboring Hoboken, Charm City. And charming it is: Lead Vanessa Hudgens plays Emily Locke, a determined Wharton graduate hoping to whip Van’s company, Wayne Security, into shape. But her research and development team, staffed by Teddy (Danny Pudi), Ron (Ron Funches), and Jackie (Christina Kirk), is extremely unmotivated, partly because Van’s a terrible boss, and partly because it’s hard to feel like your work matters, when super heroes are regularly saving the day (and destroying property) outside your office window. Hudgens plays the foil to a talented comedic cast — Tudyk is the standout, but Pudi and Funches are not slouches — and pulls it off with aplomb; for an actress who has never lead a television show, much less a comedy, she’s adjusting well to sitcom rhythms. It’s very early to say more; the show went through major changes in development, and NBC only released the much workshopped pilot to critics. But there’s a light, nimble humor to the show’s treatment of superpowers and heroic antics — a much needed respite from the angst and self-seriousness of so many superheroes on the small-screen, who are all so fixated on saving the world. The sitcom’s heroes are just trying to save their jobs — and discovering along the way that their little inventions are minute contributions to greater causes. Their first invention together saves the company and gets Van in cousin Bruce’s good graces — and “somehow” finds its way into the hands of Batman himself. How ever did he find it? The cast of “Powerless” may never know.